Now with a side of Taco! Dresses vs Trousers: Sewing Meet Up Dress Code? So, after a week of vacation with Phin, I'm back home. Two and a half weeks in Europe means the jet lag is lingering, and I'm still reflecting on the epic meet up in London. One thing that stood out to me at the NYLon meet up was that about 64 of the 71 attendees wore dresses or skirt ensembles. There was an army of beautiful Anna's, which I suppose was a propos, and other By Hand London, Colette and Sewaholic patterns were represented, too. However, this left those of us wearing trousers or jumpsuits in the distinct minority. I'd be tempted to attribute this to the meet up taking place on the first truly nice spring day in London. It was the perfect day to finally don a pretty frock after a long winter. However, I've been to too many meet ups to chalk this up simply to nice weather. It's definitely a trend - wearing self-sewn dresses to meet ups. And I'm eager for your thoughts. 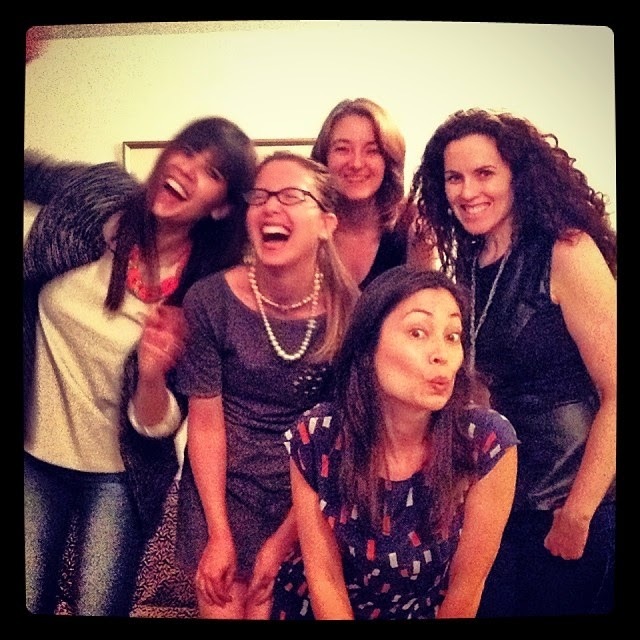 Why is it we choose dresses for meetups? Is it that a pretty dress is a sewists' calling card - the garment that we are most proud of? Is it that most of us don't have enough occasions to wear those pretty dresses that we sew and this is an opportunity to pull out our frosting? Or does it have to do with our fear of sewing trousers? When you look around the blogosphere, it does seem like we sew more dresses than trousers. As a community, I think we build trouser sewing up into something challenging and scary. Even experienced sewists sometimes approach pants with apprehension. So, is it that we are not sewing as many trousers? Or that we are not as happy with the final results of our trouser sewing? I have to say, I was truly impressed with with jumpsuits worn by Clare of Sew Dixie Lou and Nicole Needles - both took some real skill and looked incredibly chic. Lastly, how do you decide what to wear to a sewing meet up? I confess that there was a pre-NYLon fashion show at the flat where we all oohed and aahed and decided what to wear. We also discussed that there is some (self-imposed?) pressure when it comes to dressing for a meet up. I generally end up wearing something I've sewn recently, am proud of and feel great in. In the end, I was totally happy with my "very Clio" outfit, as DevviePuu put it. I'm definitely more proud of the blue trousers I wore than of just about any dress I've sewn - a ton of work went into them, they challenged my style, and I really worked on my welt pocket skills for the project. So, for me, the choice was about wearing something that I felt reflected me and my sewing skills - a garment that I would be happy to talk about to others. Anyway, what are your thoughts? Why do you think we favor dresses over trousers? Do you feel meet-up outfit pressure? How do you decided what to wear to meet other sewists? So, I said goodbye to London, and Phin has joined me for a few days in Paris and Amsterdam. 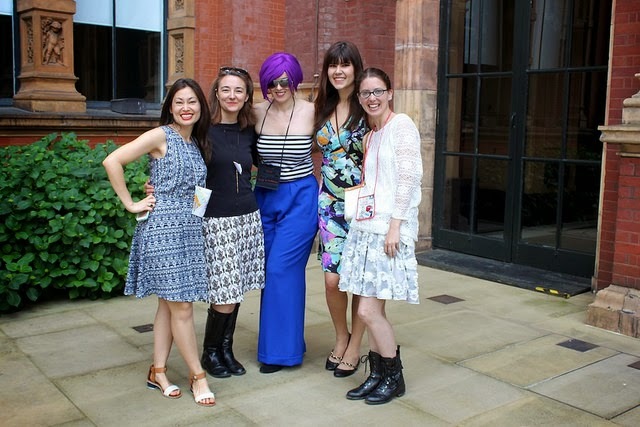 But here are three reasons why sewing meetups - and NYLon 2014 in particular - are awesome. 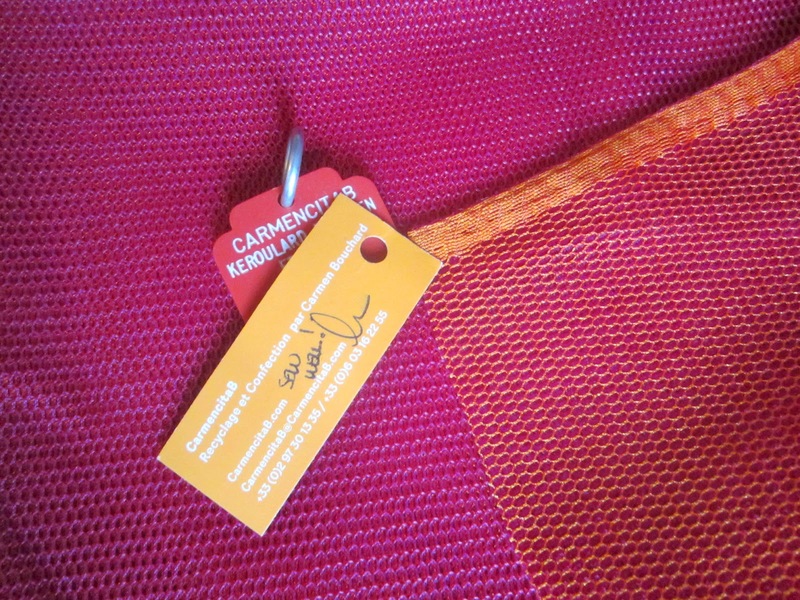 This is two metres of hot pink and orange mesh that Carmencita B brought me from France. I had commented how awesome it was when she posted it on FB a few weeks ago. Jen of Workroom Social, one of my weekend flatmates, made me a name tag for the NYLon meetup that was totally my style and could not have gone with my outfit better! After 2 years of subtle lobbying, Devra has somehow gotten me thinking that I may sew a tweedy sort of jacket lined in Liberty tana, and Rachel is providing me with a pattern. 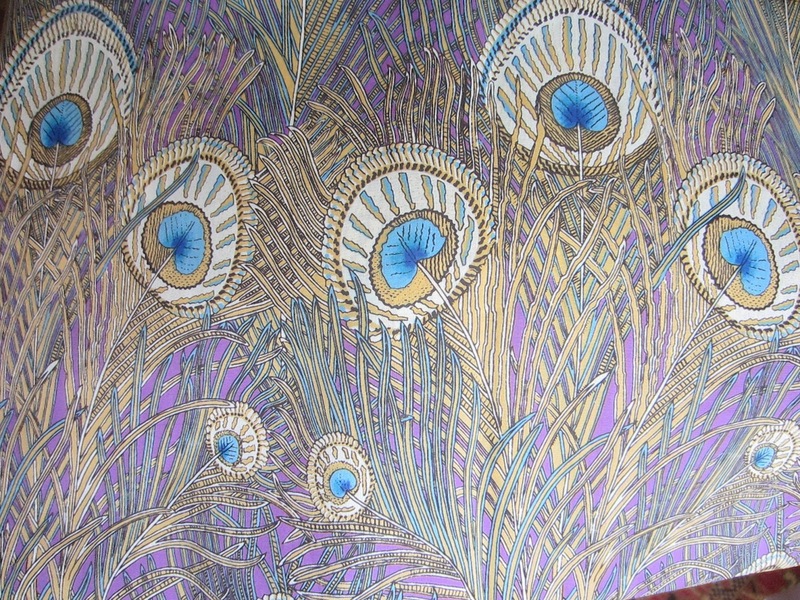 I would not go as far as saying I will be sewing a French couture jacket any time soon, but, well, I am coming home with a few metres of this Liberty large scale peacock print. A few others have done round ups with photos (Did You Make That? and The Overflowing Stash) and Twitter and Instagram (search for #NYLon2014) abound with NYLon 2014 awesomeness, so I'll simply say: how could a 70+ person meetup be anything other than epic? And with weekend flatmates like Devviepuu, Jennifer, Vicki and Rachel, how could it not have been one amazing weekend-long pajama party? I can't wait until next time...Now, off in search of a croissant! Folks, excitement is running high at NYLon headquarters where Rachel, Puu, Jennifer, Vicki and I are watching The Great British Sewing Bee in pj's. 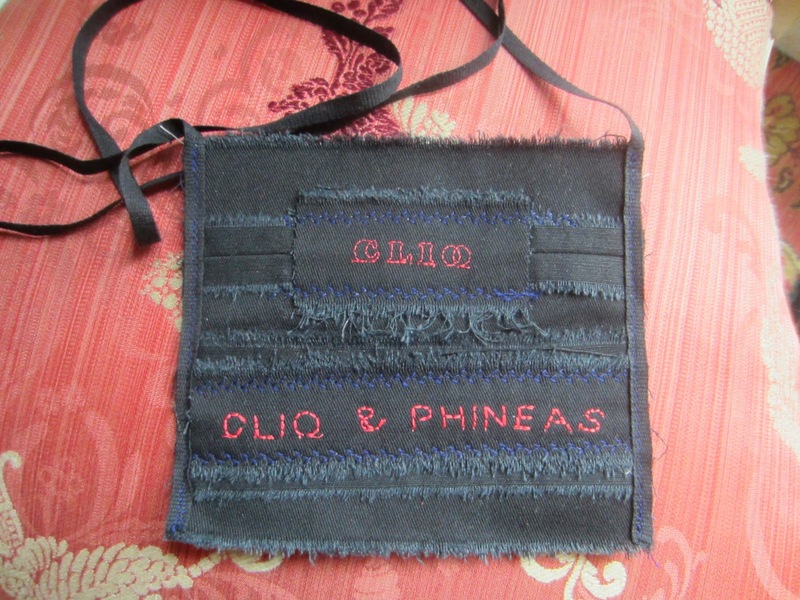 One of my last little projects before leaving home is a handmade name tag for the meet up. I have to confess that I felt a lot of pressure about this project because 1) I was making a name tag for Rachel Pinheiro who is the queen of craftiness and 2) I don't think of myself as being particularly crafty. Stop laughing. It's true. I don't generally join ornament swaps or other crafty endeavors, because I'm just not confident in that department. And cute is outside my comfort zone. So, I tried to make a "name tag" that reflected my own style and the city I call home. And what is more NY-ish than our all black dress code? I sliced up the zipper and made it into trim. I used lace hook tape as a closure and I backed the whole thing with grosgrain ribbon. And here it is on Rachel, herself. London people, we are so looking forward to seeing you tomorrow (get your beauty sleep!) and everyone else, we wish you were here! Finished: Too Cool For School Pants! It was so nice to be back in my native habitat (aka the Craft Lounge) this weekend so that I could actually sew something before heading off for 2 1/2 weeks of travel (work + #NYLon2014 + vacay with Phin). I finished my Alexander McQueen jacket, worked on a mini project for NYLon and sewed pants. Whew! Back when I decided to give some Indie patterns a try, I bought a few Ralph Pink patterns including the Hareem Pants from his Catwalk/Trend line. Sarouel (aka dropped crotch or harem) pants are one of those styles that I've always reflexively thought of as being "not for me" but have secretly loved/envied from afar on others - they convey such a cool confidence. But since I've embraced a "why not for me?" attitude in the last several years with my sewing, it was only a matter of time before I gave them a shot myself. I went into this project thinking that sarouels would be a great alternative to the yoga pants that I often wear in the evenings post-run/gym while curled up on the couch with Phin. But I was wrong. These pants cannot be wasted on the couch. "Why are you torturing me!?!?" pose. Um...this was not one of our easier photo shoots. But this was one of the easiest things I've ever sewn; I should sew a dozen more. In the past when I've tried quick and easy patterns, the results have ranged from disappointing to disastrous, mostly because of the fit. Many "easy" patterns are flowy, unfitted shapes which don't really work on my figure. But the loose hip and thigh fit with a fitted waist and ankles seems to work on me. The style is definitely not for everyone. The crotch on these pants is down at my knees, and that is with the waistband folded over so they are sitting higher than on the line drawing. I think this was drafted for someone rather tall (and I'm 5'9"). To me, this is an awesome feature since I didn't have to add any length whatsoever to these - a first for pants! Anyway, in just an afternoon I went from taping these pattern pieces together to standing in front of the mirror thinking about how to accessorize this outfit. It helped that I constructed them entirely with my serger. Even though the pattern has just 3 pieces, the instructions are very thorough and well illustrated (see here). Thinking these would end up being "cuddlewear," I used modal from my stash. Modal is my favorite fabric for pj's. The pattern calls for ribbing for the cuffs and waistband. However, I had none on hand and matching two different black fabrics is an awful task. So, I decided to use modal for all. 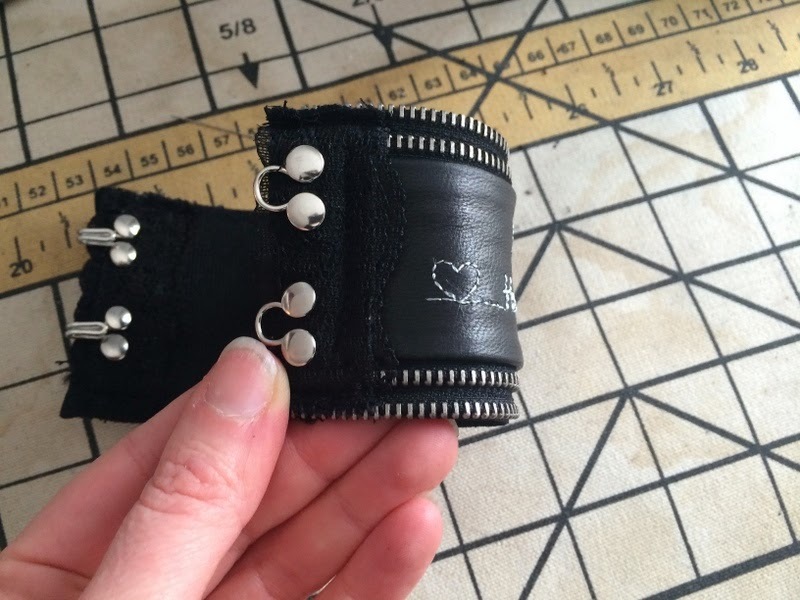 This required making the waistband and cuff pieces wider than drafted since modal is not as stretchy as ribbing. But that is the only alteration I made to the pattern. Anyway, these are a keeper - super comfy, fun for casual afternoons out and easy to wear. I feel very hip in this outfit. I may have to make a second pair out of a dressier fabric - a stretch silk version would be tres chic for evenings out. Anyway, I'm super pleased with this pattern and feeling like Ralph Pink may be the indie pattern line for me. These will definitely be packed for the #NYLon2014 meetup as a possible outfit, although, I think with a different belt. Seriously, what do you wear to meet lots of other sewists!?! Blazer of Glory Challenge Final Week: Buttons, Buttonholes, Topstitching! Who needs a cutting table? Daily Action: Post a Positive Review on Yelp/TripAdvisor/Etc. Finished: Niizo Hobo Canvas Bag! What Would Nancy Drew Wear? Polka Dot Overload | Sewing, knitting & vintage projects, tips, tutorials and cartoons! Mini-TUTORIAL: Gathered or Puffed? It's all about the Seam Allowances! Project WD: And so it begins.